A Year of Being Here: Sarah Busse: "Evening Walk, Mid-March"
and grass, clumped and frizzled, and mud. Mud. needs washing, and a second rinse cycle. But the sky is full of occasion—robins. cheerily around the entire suburban block. waxy and bibulous as a pubhouse or bridal shower. and then and now we are arrived at home. "Evening Walk, Mid-March" by Sarah Busse, from Quiver: Poems (Red Dragonfly Press, 2009). Text as presented on Your Daily Poem (03/16/2014). 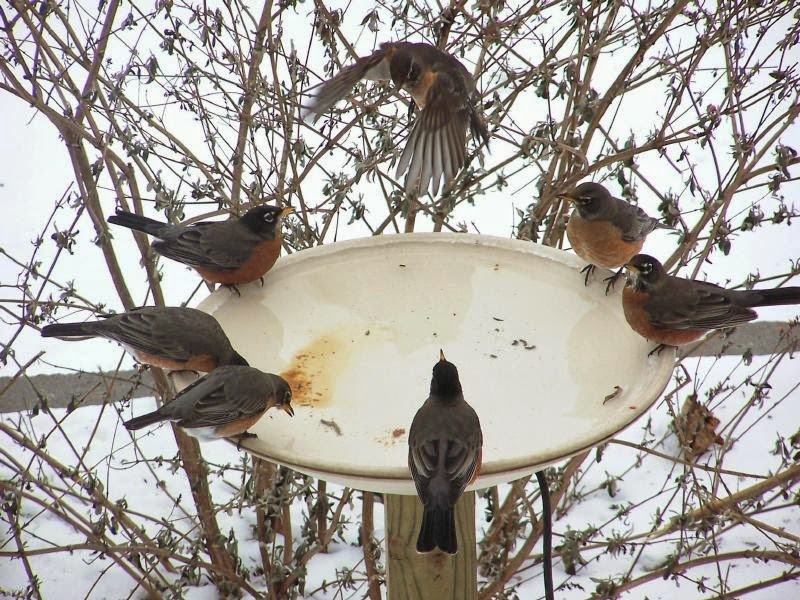 Art credit: "Winter robins flock together at a bird bath," photograph by Becky Stanton.